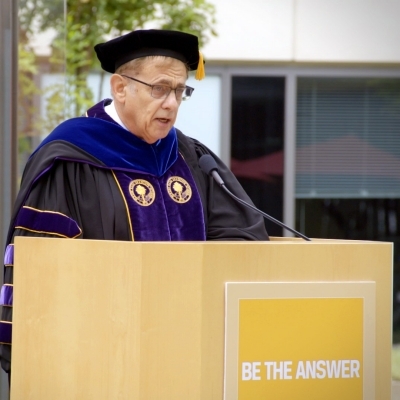 To families and friends of our graduates; Pardee RAND faculty; the Board of Governors; RAND trustees, RAND staff and alumni; and other distinguished guests; I join the Dean in welcoming you to RAND on this wonderful day. And, to our graduates: Congratulations! You have completed a program of remarkable breadth and rigor. Each of us feels a special pride in you as well as great confidence that you will accomplish important things in the years to come. I am very glad that Dean Marquis remembered our founding Dean, Charles Wolf. It is no exaggeration to say that none of us would be here today if it weren’t for Dean Wolf's vision and follow-through. He developed what was initially a very unusual experiment into the world’s foremost public-policy doctoral program. And just last week, the RAND community lost Frank Carlucci, a diplomat, senior government official in both Republican and Democratic Administrations, someone who truly earned the title of statesman. He was a valuable member of RAND’s board of trustees for 30 years, . . . father-in-law to a Pardee RAND grad. Along with his wife, Marcia, he has been a generous donor to Pardee RAND. Frank Carlucci, too, will be sorely missed. It’s because of Dean Wolf that the Pardee RAND Graduate School has a special place in both my heart and my vision for RAND. He recruited me to teach courses, advise students, and chair dissertation committees. And, for a very pleasant decade, I chaired the School’s admissions committee. That, I must say, was a humbling experience. If you knew the caliber of the people we do not admit, you would understand why. I am now well into my fifth decade at RAND. I know—that kind of longevity must sound bizarre to the millennial generation. But, for me, RAND has always been more than an employer; my work has always been more than a job. From the very beginning, I saw RAND as the embodiment of a profound idea: The idea that complex and difficult public-policy problems should be solved on the basis of rigorous and objective analysis. That is what RAND has done for 70 years. When the methods and tools needed to solve difficult policy problems did not exist, RAND researchers invented them: Dynamic programming; game theory; linear programming; the Delphi technique; planning, programming & budgeting; SIMSCRIPT; LCOM; systems analysis; appropriateness of care; assumption-based planning; Dyna-Metric; robust decisionmaking; and more. Each of these techniques was created or substantially improved by RAND researchers because they were tackling policy problems that required new analytical capabilities. This track record of innovation has helped define RAND and it will be even more essential in the years ahead. As I expect our featured speaker will tell us, the future will present policy problems and decisionmaking challenges of unprecedented complexity. We will undoubtedly need new methods and tools. Many exist elsewhere and will have to be imported and adapted. Others will have to be invented, just as we have done so many times before. RAND has many assets to meet these and other future challenges, but it has at least one asset that no other research organization, that no other think tank has: A world-class doctoral program, integrated with its research operations. That is why I am looking to Pardee RAND to do even more than produce unmatched graduates like the ones we are saluting today. I have in mind a graduate school that is spearheading the reinvention of the science and art of policy formulation, evaluation, and implementation. I have in mind a graduate school that is an integral part of the RAND intellectual ecosystem, helping RAND accelerate its pace of innovation. That transformation has begun; the Dean and I invite and need each of you to be part of it. Professor Jennifer Kavanagh and I wrote a book about this last year: We call these trends, "Truth Decay." Truth Decay is antithetical to what I called the RAND idea. Truth Decay erodes civil discourse. It contributes to dysfunction and gridlock in government. It increases uncertainty about policy directions and policy consistency. It accelerates the detachment among our citizens from their government and from civic life more broadly. In short, Truth Decay presents a serious threat to the institutions of our democracy. It transcends political parties. It’s not confined to particular regions of America. And, it’s not limited to United States. Newton Minow, who chaired the Federal Communications Commission in the Kennedy Administration and who chaired the RAND Board of Trustees when the Pardee RAND Graduate School was established, has called "Truth Decay” the existential threat of our time. Every member of the RAND community, but especially those with PhDs from Pardee RAND, must become vigilant defenders and active proponents of the proposition that when solving public policy problems, facts matter, just as they do in every other walk of life. Rigorous and objective research and analysis makes a difference. Each of you came to Pardee RAND with a special combination of experience, intelligence, vision, and passion. You leave with all that, plus an unmatched set of analytical skills. I am looking forward to what you will accomplish in so many diverse fields and settings. But, no matter where you go or what you do, I hope each of you will join me and RAND in the fight against Truth Decay. Our future depends on the outcome of that fight.